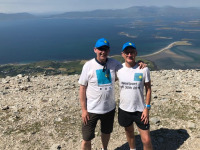 Climbing up Croagh Patrick to raise funds for worthwhile charities fighting Neurological Diseases. I will be climbing Croagh Patrick on June 29th to raise money for 3 very deserving Neurological Disease Registered Charities: Young Parkinson Ireland, Irish Motor Neurone Disease Association and Huntington’s Disease Association of Ireland (HDAI) . They are all in dire need of funds to provide specialist nursing care to patients. All funds raised here will be equally divided and sent directly to these 3 great causes. My motivation is to improve the availability of Neurological Disease Specialised Care after learning what my friend John Kelly witnessed when close family members were in need. Be Frank first fantastic supporter.